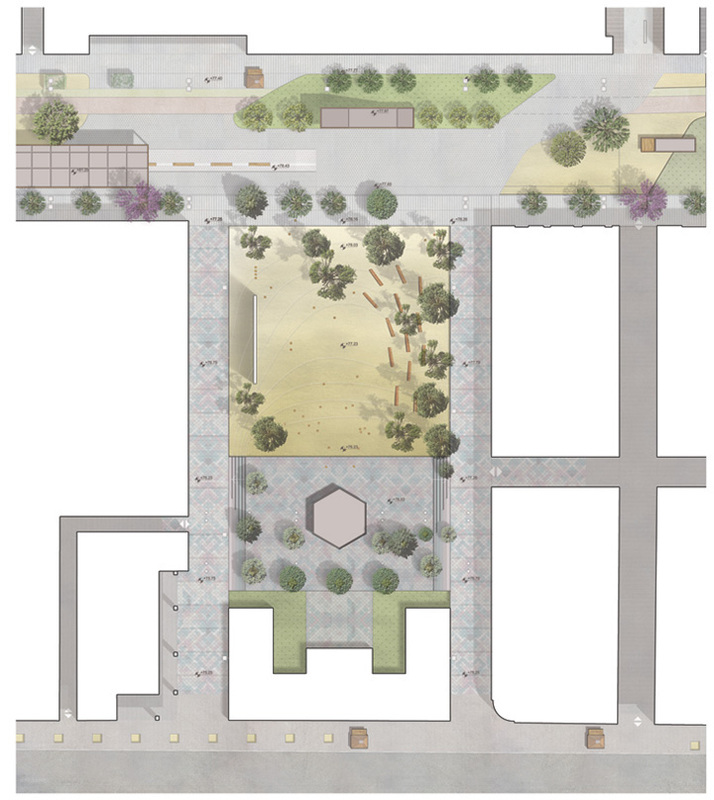 The proposal Athens as Home aspires to invert the prevailing mentality in Greece of disregard towards public space, by giving incentives so that the public space of Athens might be felt again as home. Athens needs a strategic vision for its development, a strategy which will incorporate citizens and visitors, new functions, an extrovert city profile and 24hour uses altogether under a sustainable project. 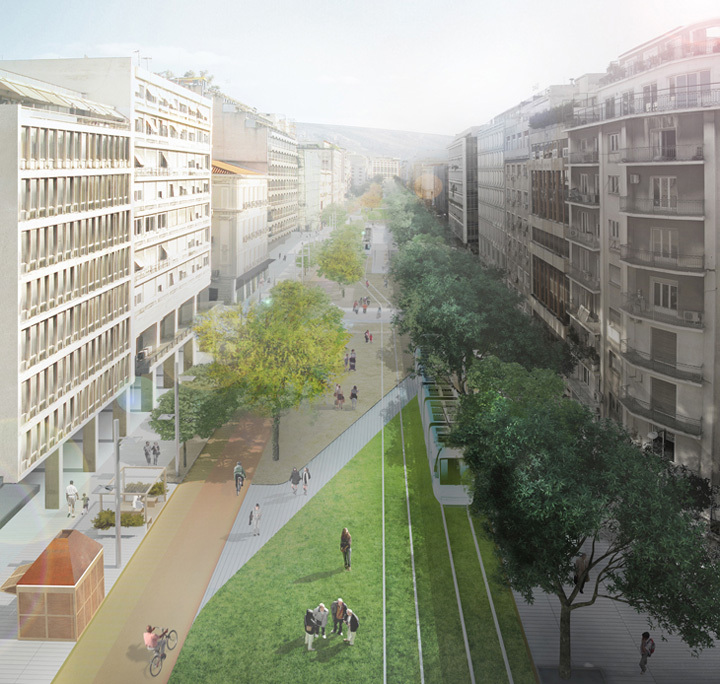 1/Panepistimiou Street as a green corridor: the avenue of the mimosas is back. 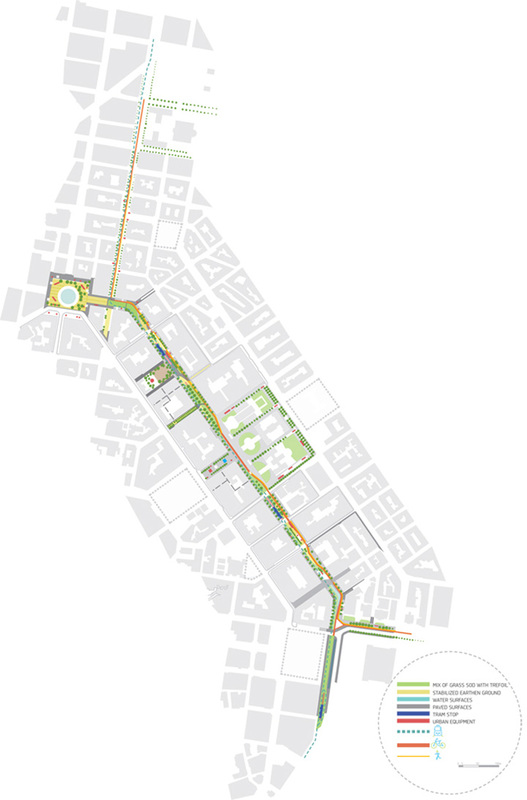 Natural elements, such as trees, soil, grass, bushes, sand and water, are running down Panepistimiou Street as a green river, creating a green corridor of urban comfort. The proposed trees are endemic and characteristic of the Athenian landscape. For instance, the tree of Mimosa (Acacia farnesiana) is introduced for its colour and scent, but also as a reminder of a typical Athenian tree since Panepistimiou was also known as “the boulevard with the mimosas”. Panepistimiou Street is also extended through its arcades, a common urban characteristic of Athens, where special lighting features are added in order to create an attractive environment during night time. 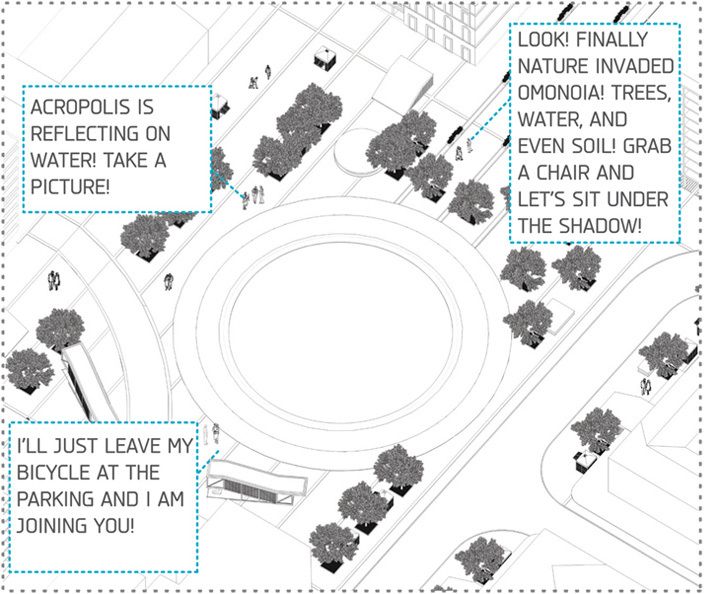 The proposal introduces an innovative feature for paving Panepistimiou Street. It is based on a structure of concrete elements that are joined together through an elevated system that does not use mortar. The advantages of such a system are quick construction, easy access for the infrastructure and the networks, thermal comfort in hot days through cooling effect of air circulation and fast water drainage in case of rain. 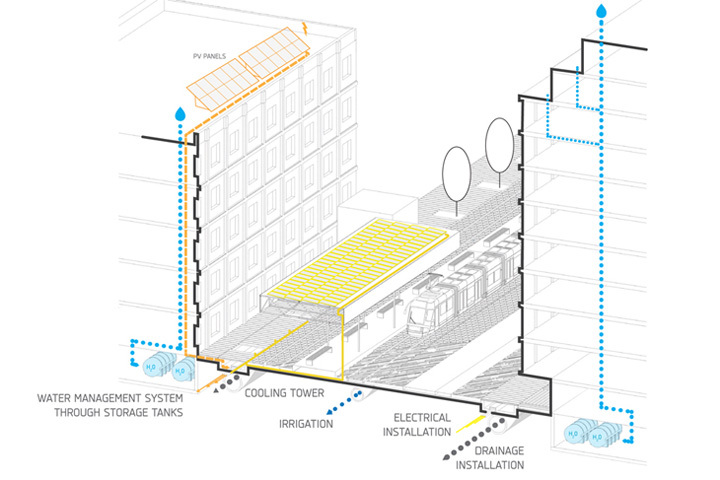 Panepistimiou Street can also become a pilot project for the production and use of green energy: adjacent buildings of public or (willing) private property can contribute to the inauguration of a sustainable solar energy and water management strategy (photovoltaic installations on rooftops, water tanks on their basements). the Square of the Cities (Trilogy): This complex was designed in the late 19th century by the Hansen brothers and was a creation with intentions of extroversion : the architectural style aspired to give Athens the identity that the European world wanted the city to have. This quality of extroversion is chosen to be enhanced today. 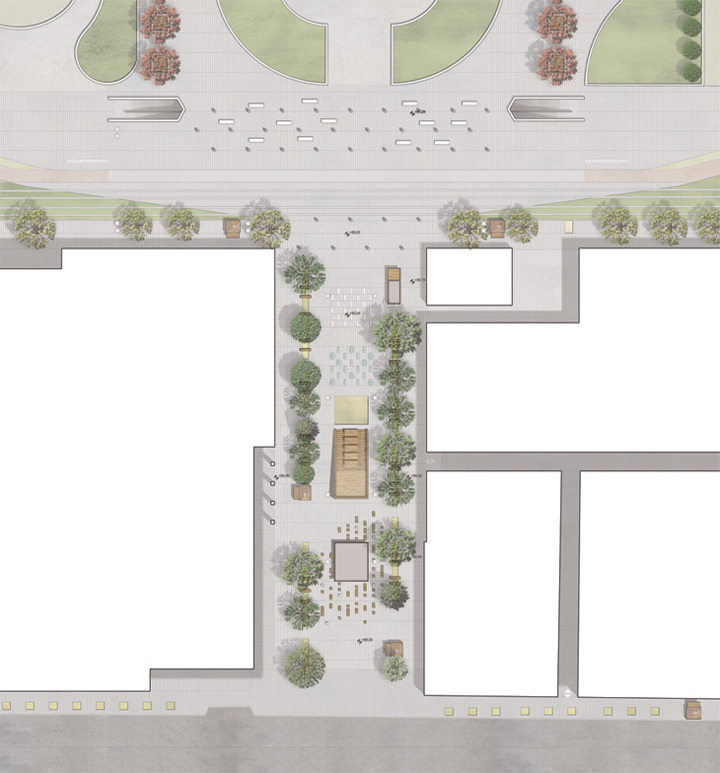 This square will function as a reminder of the role that Athens plays within an extended network of the European and Mediterranean cities, since the cities are today the crucial territories. This square incorporates in its design points of relation with other cities, each of which will be represented by an element of screen panel. 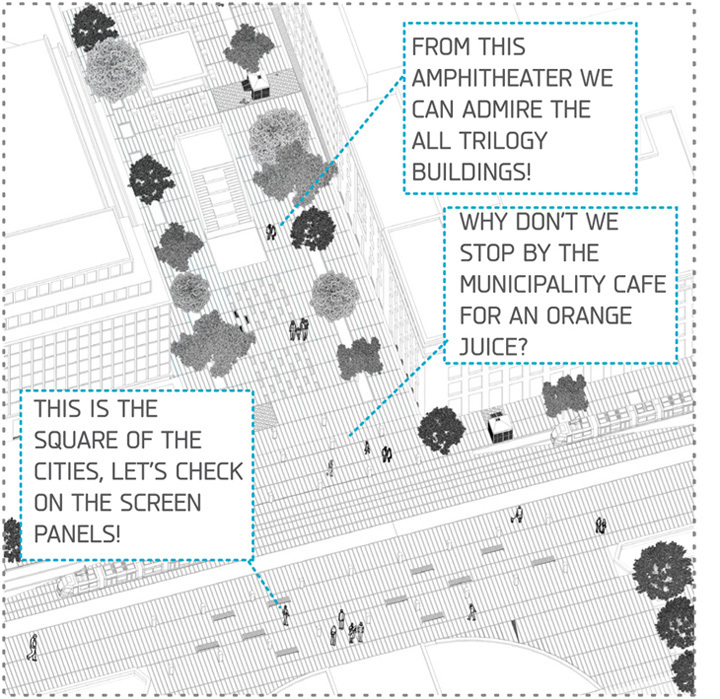 Events can be held upon several occasions and this square will be a strategic point in the role and image of Athens. It is a symbolic beginning of the city-to-city collaboration. 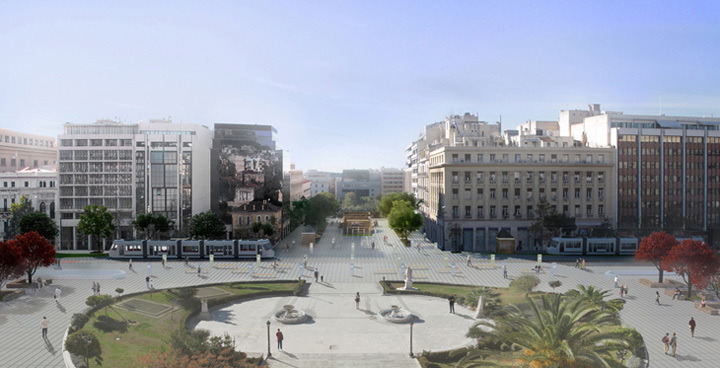 the Square of transparency and dialogue (Omonoia square): Omonoia Square is considered as the continuous place of reflection and political transparency, where the water is present in its symbolic essence, but also as a bioclimatic feature. 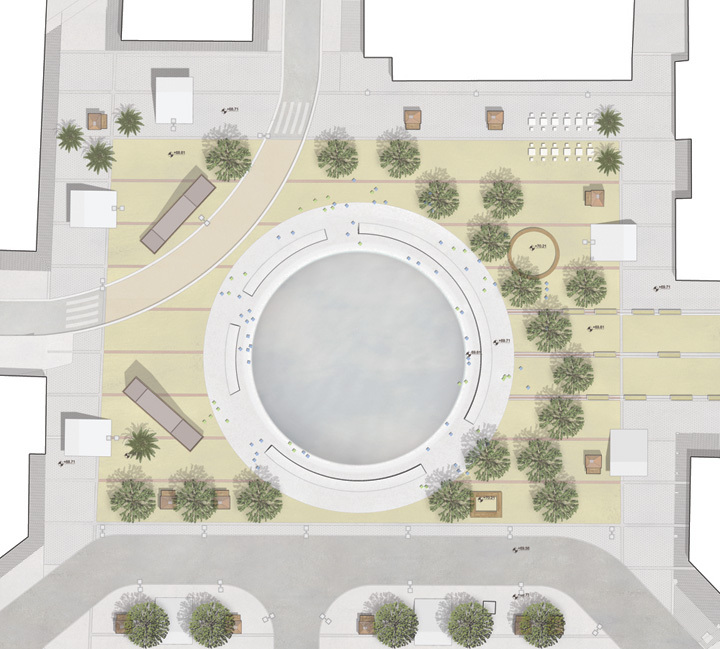 The circular water pond, around which people can sit, is a reminder of the design of the square during the 60’s. The main surface of the square is of stabilized earthen ground and Mulberry trees (Morus platanifolia) are chosen as they are native to the Mediterranean region and tend to grow a large canopy that offers a thick shadow. Under their shadow, movable chairs are provided as an element of urban equipment that can function under total liberty, but also requires also a respect for the public space and equipment. the Square of the Arts (Dikaiosunis Square): The square of the Arts is the centre of the creative artistic production and aims to attract mainly young people. Its vivid identity refers mainly to the landmarks of Rex theatre, as well as to the local character of this area that hosts most of the music retail stores of the centre of Athens. 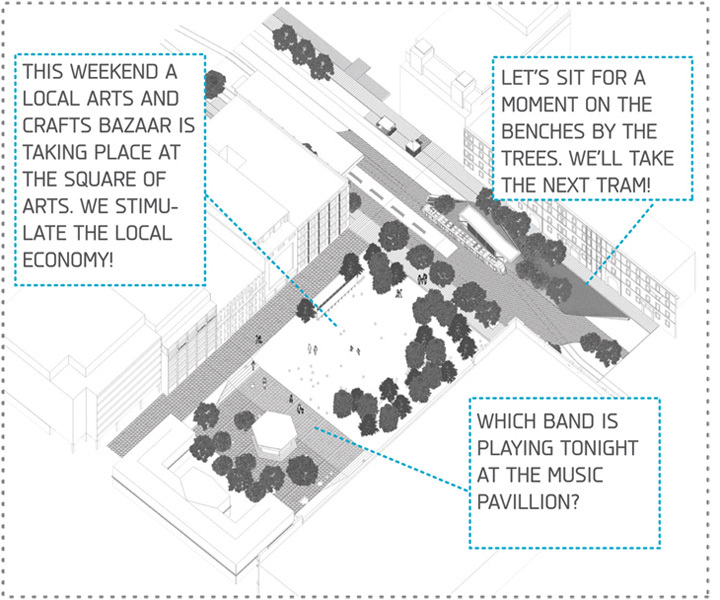 A large screen, as well as a music pavilion will offer a place for expression for the artistic groups of the city. The trees of this square are kept and are enhanced by stone pines. The urban environment quality is projected into the optional/recreational activities that are created by the multiplicity of options that the urban space provides through spatial configurations or various equipment. A bench to sit under the shadow of a climber tree, a playground where children can play, an amphitheatre for discussion, a ping pong table can produce these qualities and lead to the development of social activities, and thus the maximum pedestrian circulation at street level. It is of utmost importance to create a social acceptability and interest in the restructuring of the Athenian centre. For this reason, it is important to communicate the intentions of the project and to organise local workshops for the citizen’s participation. On the other hand, it is equally important to give a strong identity to the project, a visual identity that redefines Panepistimiou Street as a contemporary boulevard and as a dynamic part of Athens. 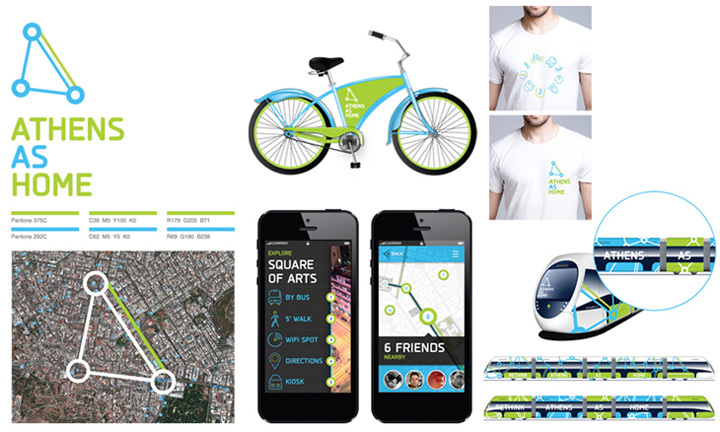 A logo is thus introduced that will have several applications and serve the urban identity and signage. The basic inspiration in creating the logo was the historic and commercial centre of Athens, that is circumscribed by Ermou, Stadiou and Athinas Streets and the integration of Panepistimiou street as a green corridor in this system.